Tag Heuer’s Aquaracer watches are stunningly inspired by the early watches made to meet the needs of sailors and divers. As such this watch promises not only accuracy, but also a sleek elegant design. The Aquaracer collection is one with credibility, due to the fact that the Aquaracer 500M (a different watch of the Aquaracer collection) is worn by Leonardo DiCaprio. 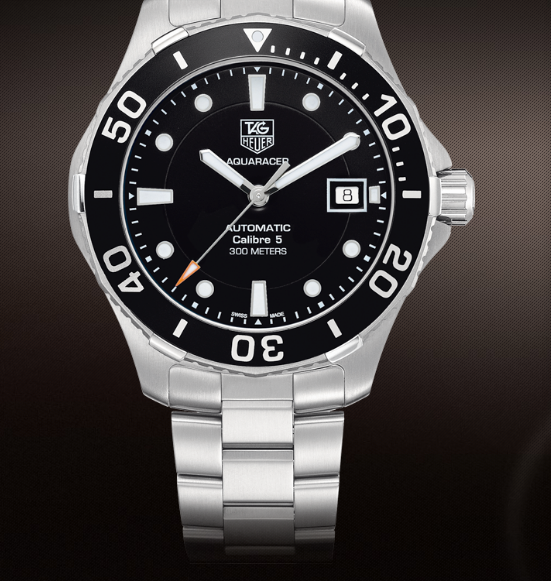 The Calibre 5, 41 MM promises an elegant sporty look with easy readability, and excellent water resistance. The Aquaracer Calibre 5, 41 MM, automatic watch comes with either a blue or black dial face. The navy blue offers a more sporty look, fitting in well with its nautical heritage. The blue looks simply stunning against the fine-brushed steel bracelet. If you go with the black dial, you will have a watch with a timeless look. You can be sure it will look great in any suit. The display has easily legible lettering, and bold luminescent arms and markers to ensure that you can see this watch in dark conditions. The arms are thick, and the second hand has an orange arrow tip at the end. This strays from the classic look, but it doesn’t look over done. Instead it gives it a fun sporty feel that looks amazing. This watch is made to last with water resistance up to 300 meters, and scratch resistant sapphire glass.The water resistance is imperfect and wears out with repeat use (after all, it is water resistant, not water immune!). If you plan on repeatedly exposing the watch to water it is advised that you have maintenance done on the seal regularly. Depending on where you buy this watch you can expect to pay anywhere between $1,200 and $1,500, or more. Prices vary with color (blue tends to cost more). For an Aquaracer you are look at spending at least $1,000, so the Calibre 5, 41 MM costs a little more than the basic model. For people looking for something a little different there are some excellent alternatives to this model. The Aquaracer WAF1112.BA0801 looks great and has many of the same features as the caliber 5, 41 MM model, but available in an excellent silver design. Additionally, the Aquaracer automatic 500M, caliber 5 has many of the same features, and a similar look, but offers increased durability with 500 meters of water resistance for divers. However, for this higher end model you’ll be looking at paying around $800 more than the 41MM Calibre 5. If you want a fun watch that will look great whether you’re suited up, or in an everyday shirt than the 41MM, Calibre 5 Aquaracer is a great watch at a decent price. You can buy this watch and be comfortable in knowing that it can stand up to the elements with ease, and look fantastic. hello one question i have read in various sites about a qualite probleme concerning this model or this calibre. could you help me , because if its true i think the carrera automatic would be better choice.